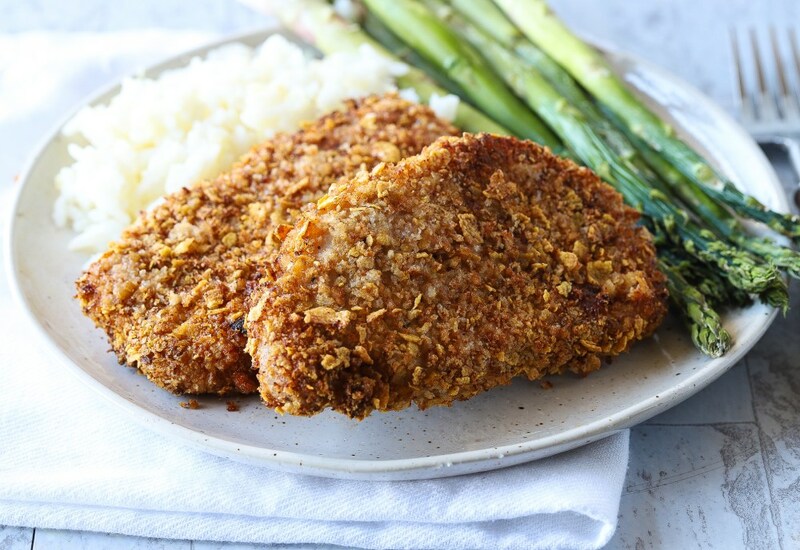 Pork chops are coated in panko bread crumbs and crushed cornflakes cereal, creating a very crispy pork chop experience. Everyone in your family will love them! The best part is that they only need to cook for about 12 minutes and because they are cooked in the air fryer, you won't need a lot of oil to make them crispy. Serve these with rice and asparagus or your favorite grain and green for a complete meal. This can be made to be gluten-free by using gluten-free panko bread crumbs and gluten-free cornflakes cereal. Per Serving: 108 calories; 4g fat; 8.5g carbohydrates; 9g protein; 48mg cholesterol; 285mg sodium. Fried pork chops are one of my favorite childhood recipes but they are so greasy when deep fried! I was so happy when I found this recipe, I especially love the cornflakes crust. It was crunchy on the outside and perfectly cooked on the inside. I added some seasoned salt to this recipe and it was delicious. Kid friendly! It's so hard trying to find something my kids like to eat. Now I don't have to make two separate meals for me and for them! The meat was tender, not overcooked, and well seasoned. My air fryer was the best investment.